kiyor (כִּיִוֹר) = basin, laver. Solomon’s temple has ten such basins, cast out of regular molten bronze rather than mirrors, perched on elaborate wheeled stands. But King Solomon also has his master bronze artisan cast a water container so huge it is called a sea. yam (יָם) = sea; in Canaanite religion, the name of the god of the sea. This tub of water would be more than 14 feet (4 meters) across and more than 7 feet (2 meters) high. 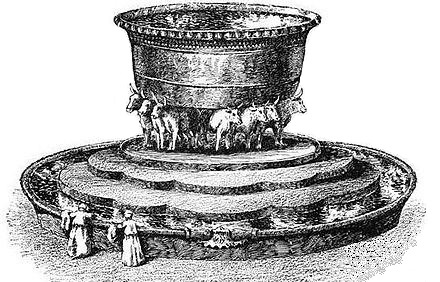 Since it would be impossible to climb into for bathing, commentators have concluded it had an outlet like a spigot at the bottom, to pour water into a shallower container for washing. The most striking difference between the yam in front of Solomon’s temple and the kiyor in front of Moses’ tent sanctuary is that the yam rests on twelve bronze cows—probably life-size—instead of on an ordinary framework. 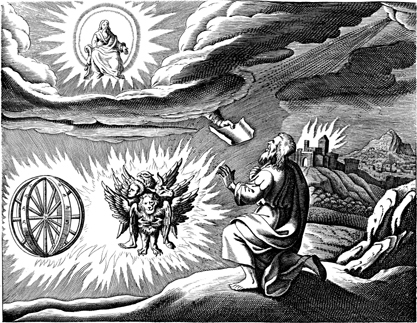 Moses discourages the molding of any real animals (as opposed to the keruvim, the composite fantasy animals whose wings are spread over the ark). He smashes and grinds up the golden calf that Aaron makes in the book of Exodus. In a passage after this week’s hafatarah, the first book of Kings criticizes King Jereboam of Israel for putting golden calves in temples at Dan and Bethel. This may have been a reaction to cow-worship in other religions. 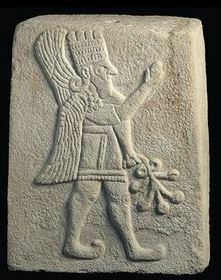 The religion of the Hittites to the north included a pair of bulls who carried the weather god Teshub on their backs. 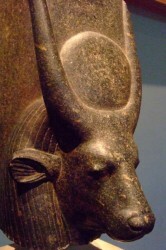 To the south, Egyptians worshipped the bull as Apis, the avatar of the gods Ptah and Osiris, and the cow as the goddess Hathor. Yet throughout the bible, the twelve bronze oxen supporting the yam in front of Solomon’s temple are treated as perfectly acceptable. Is the huge tub of water in front of Solomon’s temple called the yam simply because it is so large, or does it evoke the Canaanite god named Yam? Are the twelve oxen simply decorative, or do they inspire awareness of bull and cow worship? Throughout history, people have viewed symbols of the divine in two ways. Some people consider a symbolic object or building as a way to evoke the ineffable. Its beauty and impressiveness are like an arrow pointing to the divine, and its specific details (such as fruit, water, architecture that reaches toward the sky) allude to ideas about the divine. Other people see symbolic things in a more concrete way. A god visits a building or enters a statue. Carrying out rituals in sacred buildings with sacred objects is essential for pleasing the god. Either way, symbols are important—and often enduring. Even today, Mormons conduct baptisms and sealings in copies of the yam perched on twelve oxen. One question remains, for King Solomon and for us today: Which symbols from other cultures and from the history of our own culture or religion can enhance our lives, and which symbols should be discarded? 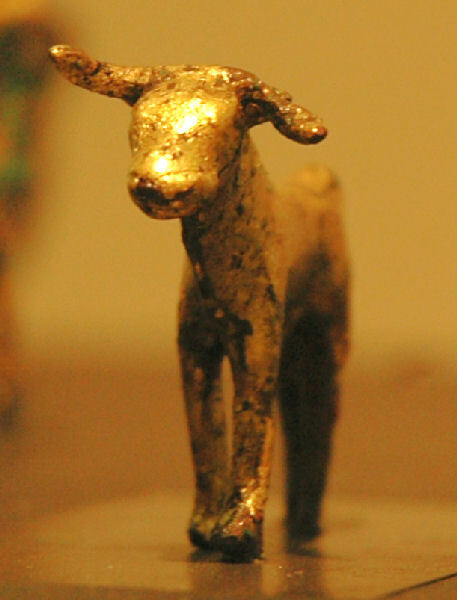 Anyone want a bronze ox? melakhah (מְלָאכָה) = tasks, job, crafts; creative work, productive work; project, enterprise. shabbat shabbaton (שַׁבַּת שַׁבָּתוֹן) = day of absolute stopping. Immediately after this, Moses hands down God’s directions for making the portable sanctuary—the most holy type of melakhah humans can do. According to most of commentary, Moses first makes it clear that the work of making the sanctuary must be confined to six days a week, then tells the people what to make. The holy day of Shabbat trumps the holy sanctuary. As confirming evidence, the commentary points to the first mention of any form of the root shavat in the Torah—after God spends six “days” creating the heavens and the earth and everything in them. vayishbot (וַיִּשְׁבֹּת) = and he/it stopped, ceased, desisted. God made the seventh day holy long before making the sanctuary (or any other place) holy. 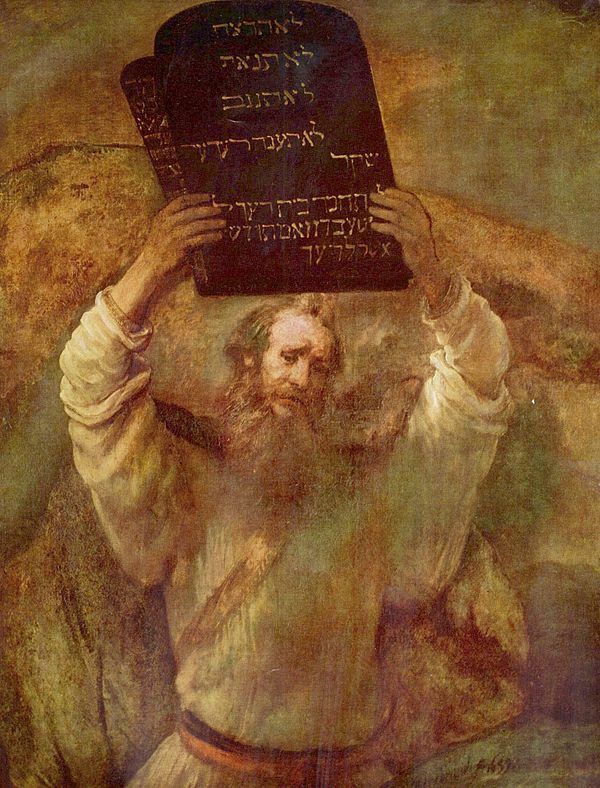 In between the beginning of Genesis and the ending of Exodus, the Torah gives us more information about Shabbat and melakhah in the fourth of the Ten Commandments. vayanach (וַיָּנָח) = and he/it rested. shavat (שָׁבַת) = he/it stopped, ceased, desisted. One divine inspiration can trigger human beings to engage in a lifetime of holy work; but if we do not stop regularly to rest and listen with our souls, our work will never be animated by new inspirations. Kindling a fire is the archetype of a human activity that is creative and useful, and enables further creative and useful work. Many ancient cultures considered kindling fire the beginning of civilization. I would add that God manifests in the Torah as a sound, a cloud, or a fire. 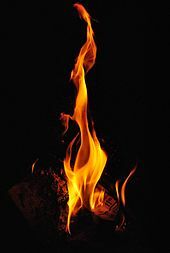 So fire can stand for our own holy work, as well as for God’s presence. 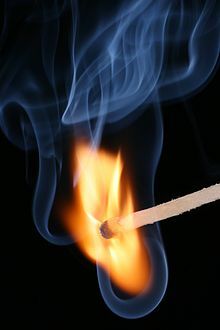 And fire represents change and activity; flames are always moving, never stopping, until the fire has burned down to an ember. I learned a hard lesson from preparing this blog post: as I suspected, I have been cheating myself. It is a pleasure to refrain from doing drudgery on Shabbat. And during the years I worked at a job that was not my calling, I was always glad to take Saturday off. But now I love my melakhah, my creative work of learning, pondering, and teaching Torah through my adult education classes, my Torah monologues, the services I lead, and this weekly blog. I love the work so much that it is hard to make myself take a vacation. I know I should rest on Shabbat, but after all, studying Torah is an approved Shabbat activity. So what if I put sticky tags next to passages I want to copy onto my computer the next day? So what if I take notes on Shabbat afternoon, even though the Talmud (in Shabbat 73a) includes writing in its list of melakhah forbidden on Shabbat? I decided long ago that I never wanted to be so strict in my observance that Shabbat became a punishment. Why not write down any ideas about the Torah that come to me? After all, studying Torah is holy work. So was making the items for the sanctuary. Rereading the portion Vayakheil this year, I can understand the value of stopping even holy work, once a week. My work makes me feel happy, but also driven. Every day that I have the blessing of time to work on Torah, I quickly kindle my inner fire. So far I have not run out of insights and observations—perhaps because I have 60 years of life to reflect upon. But I do run out of energy. I am starting to worry that my fuel supply is dwindling, and if I go on this way, I will burn out. I need to rest more. I need to re-animate my soul. I need a regular day of shabbat shabbaton, absolute stopping. The Torah is right. So I am going to start obeying the fourth commandment. I will still lead a Shabbat service now and then, having prepared the week before. But I will rest every Shabbat, and refrain from working on my next holy project. It will not be easy for me. In the Torah portions of the last few weeks, God told Moses everything that should be included in a portable sanctuary the Israelites would make for God. In this week’s Torah portion, Vayakheil (And he assembled), Moses passes on the lists to the Israelites, and points out (See?) that God has chosen Betzaleil to be in charge of creating all the items properly. Everyone can see that God has filled Betzaleil with a divine spirit or inspiration, so it is easy to believe God has singled him our or “called him by name”–a name that is oddly appropriate for his mission. What does it mean to be, or to create, in the shadow of God? Today we use the word “shadow” as a metaphor for so many things. For example, being in someone’s shadow means going unnoticed. The shadow side of a person or institution is the unacknowledged, unconscious, or repressed side. Shadowing someone is following their every move. Here “the shadow of my roof” means “under my protection”. Once Lot has offered the visitors the hospitality of his house, he feels honor-bound to protect them from the mob. Elsewhere in the Hebrew Bible, some people are under the “shadow” or protection of a government, and the luckiest people are in the “shadow” of God’s hand or wings. Those of us who live in more moderate climates might not think of a shadow as a protection or a shelter, but in the deserts of the Middle East a shadow meant shade from the burning sun. 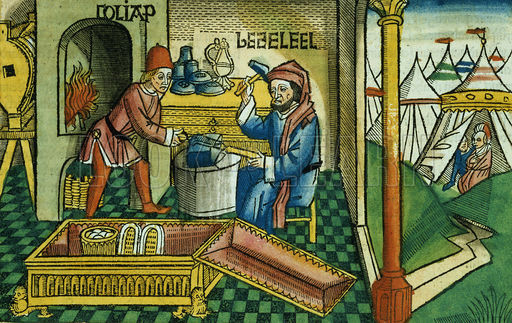 The other eight occurrences of the word tzeil, shadow, are all connected with a person’s lifespan. When that days of your life are like a shadow, it means they are brief and fleeting. Both of these metaphors can be applied to the master craftsman Betzaleil. Since he is human, his life is short compared to God’s. 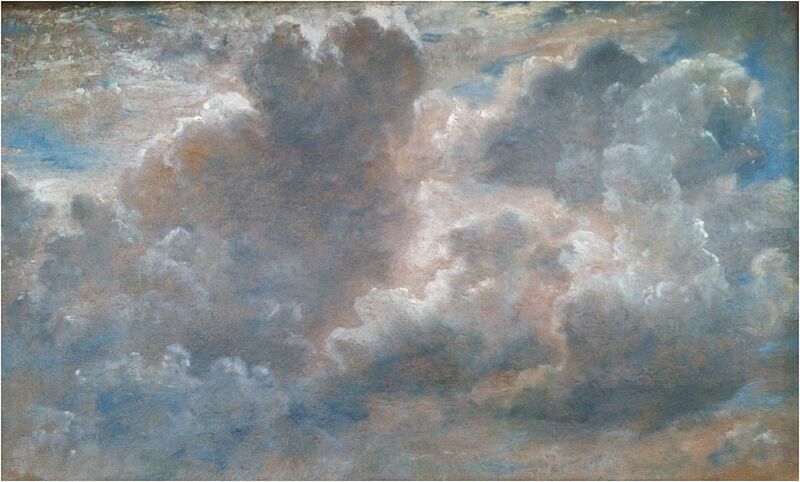 By extension, his creations, however dazzling and holy, are a mere shadow of God’s creation of the universe. On the other hand, Betzaleil is in the shadow of God, so God protects and shelters him as well as naming him. His inspiration for designing all the holy objects comes from the spirit of God, and therefore everything will come out right. Humans are shadows of God in the sense that we are like silhouettes of the divine. As two-dimensional images, our power, both to rule and to create, is limited yet still extensive. We cannot rule over the laws of nature, but we have a lot of control over this earth and its creatures. (We can even change the earth’s climate.) We cannot create a universe, but we can recombine existing elements to create new things within our universe. When we humans are at our best, when we are inspired to create, like Betzaleil, we shadow or imitate the divine. Only God can make a tree, but some poems are also inspiring. So, I imagine, was the entire work of art of the portable sanctuary, and later of the temple. It inspired the children of Israel to keep returning to their God, over the centuries, and it kept their religion alive until it could metamorphose and survive without a temple. When God calls us by name, either to rule or to create, we are given a heavy responsibility. We humans have more power than we think, for good and for ill. May we use it wisely. 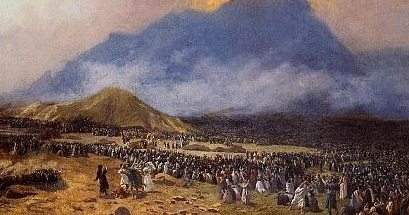 In last week’s Torah portion, while Aaron is at the foot of Mount Sinai making a golden calf, Moses is on top of the mountain receiving divine instructions for making the sanctuary God wants. Moses descends and destroys the calf and the people who worshiped it. 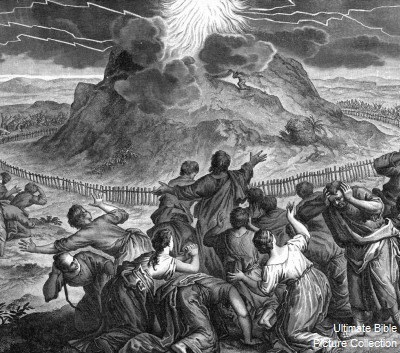 In this week’s Torah portion, Vayakheil (“And he assembled”), Moses calls together the surviving people and gives them God’s instructions for making the sanctuary. 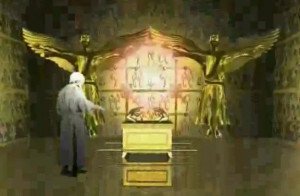 These include God’s description of the lamp-stand (menorah), and God’s choice of Betzaleil as the master craftsman. Why does the lamp-stand have seven lamps? Of course there are many theories. One is that the seven lamps stand for the seven days of creation at the beginning of the Torah. The seventh day is the sabbath/Shabbat, when God rested from the creative work. At the beginning of this week’s Torah portion, Moses first tells the people to do their own creative work (malachah) on six days, but make the seventh day holy through a complete rest for God. Only after reminding them about this rule does Moses begin to describe how they will create a sanctuary for God. If the seven lamps reflect the seven days of creation, we also need to look at the master craftsman who creates them: Betzaleil. Classic commentaries (from the 5th-century Tanchuma on) say that Moses could not visualize the lamp-stand from God’s original description. But Betzaleil could. What gave him this ability? The Torah says God filled Betzaleil with chochmah, tevunah, and da-at. In Kabbalah, chochmah (wisdom), binah (discernment; from the same root as tevunah), and da-at (knowledge) are three of the ten sefirot (divine powers; facets of God’s emanation, which creates the universe). Chochmah, binah, and da-at are the three highest sefirot accessible to human beings, containing the most divine energy. There are ten sefirot. Once I noticed that God fills Betzaleil with the top three sefirot, I looked for the other seven. Since divine emanation is so often symbolized by light, I thought of the seven lamps in a row across the top of the golden lamp-stand. It’s not easy to decide which of the seven lower sefirot corresponds to which lamp. 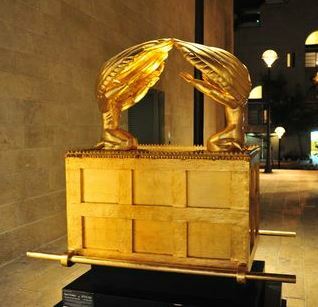 I’d say that the three lamps on the side closer to the Holy of Holies containing the ark represent the middle triad of sefirot: chessed (kindness), gevurah (discipline), and tiferet (harmony). The three lamps on the other side, closer to the entrance and the altar for animal sacrifices, would represent the lower triad of sefirot: netzchak (endurance), hod (beauty in physical movement), and yesod (ego). That leaves the middle lamp for the sefirah at the bottom of the tree of sefirot, malchut (kingdom), also called shechinah. Shechinah is the place of divine emanation of our whole physical universe, and the spirit of God in our universe. The shechinah comes closest to us on the seventh day, Shabbat! Still, speculations about specific correspondences between lamps and sefirot are not as important as the idea that God’s blueprint for the lamp-stand calls for not one lamp, but seven. The orthodox 19th-century Rabbi Samson Raphael Hirsch noted that a single lamp would imply a one-sided spirit of service. Seven lamps imply that the spirits of those who serve God must have many different aspects. Betzaleil, the master craftsman, was filled with not one but three different aspects of the divine, three different sefirot: wisdom, understanding, and knowledge. And in the same verse, the Torah says God filled him with ruach Elohim, which means a “spirit of God” … or a spirit of gods, in the plural. 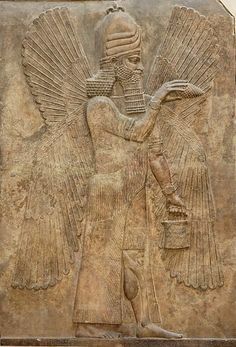 Elohim is the word for God that appears first in the story of creation; but some Kabbalists believe the unknowable God created the universe through “gods”, through various divine powers emanating from the One God; in other words, through the sefirot. Reading about the lamp-stand in the sanctuary can remind us that we serve God by lighting all the lamps of our spirits. We can move toward holiness—and spread enlightenment—through discipline as well as through loving-kindness, through individual egos as well as through harmony. May we be blessed to kindle all of our lamps.